2 by 3 Heroes: Hidden Gems: who are you? The idea of this series is simple: special cards that are unique and interesting, if not entirely famous. Today's subject is a player with a lot of fairly boring cards, but in 2011, someone over at Topps either phoned it in, or decided to troll the player for whatever reason. When I first saw this card from a pack, I figured it had to be another goofy fake player card, ala Kazuo Uzuki. If this was Seth Smith's only card, what a photo selection. No idea what his face looks like. Hell, in 2011 I could have picked up a Rockies uniform and posed as Smith and who would know without seeing my face on the card. In fact, all three folks pictured on the card could pass you on the street and you would have no idea who any of them was, or which was which person. Does this card have great framing? Yes. And that alone would make the binder. But the whole layout of the picture is what secured a slot in a 9 page. Ok - if you dare, I would like to give you a little tour down the rabbit hole of my mind. I say that as a warning to get out now if you choose. This will get interesting, ugly, scary and quite a bit weird. But, It's how my mind works, and I have to deal with it ALL THE TIME! So one site I visit on a regular basis is Deadspin, and the other sites attached to it. A while back, a post shared on a few of the sites talked about the video game Overwatch and an update that added some skins and little dances to the characters. Now, I don't play the game at all, but it does look cool. And click that link. How adorable is that animated gif at the top with Sombra doing some shuffling? A couple days later, somehow I came upon this video that a user put together that shows all the dancing emotes and a reference video of what the dance is. In the video I see the emote for Bastion (2:03) in the video, which shows that Bastion is doing the train, which the video maker synced with a video of some kids at a minor league ballgame doing the similar dance to "C'mon 'N Ride It" by the Quad City DJ's. OH MAN - I haven't heard that song in a while! So I searched the video on YouTube to get the whole song played. While listening, I remembered that hip hop samples the hell out of the music world, so what song or songs did Quad City DJs sample. Fortunately, Wikipedia will usually help you out, and on this page, I learn the sampled song was the theme song from a movie Together Brothers, the soundtrack written by Barry White. Yes - THAT Barry White. But the Quad City DJs didn't sample it. They straight ripped it off, adding a few lyrics, yelps and a louder beat. But otherwise, it is the exact same song. Let me post them both and you can see how identical they are. How great of a funk song did Barry White pen? This song has been sampled in many other hip hop music, and is the hidden gem, a groovy jam that could not walk down the street and be recognized, mainly, because of Quad Ciry DJs. 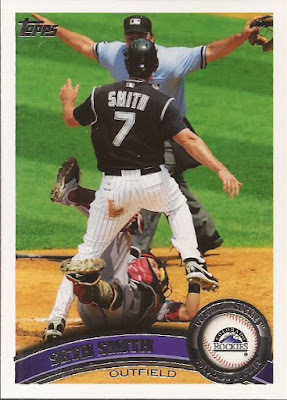 Yup - I just linked Seth Smith's 2011 Topps card with the late, great Barry White. It's my blog. Wow, I completely forgot about Quad City DJs. There's a blat from the past. Anytime you can tie together Barry White and Seth Smith, you know you have a great post. I will always associate C'mon 'N Ride It with the San Jose Sabercats... actually the Saberkittens. Their dance routine for this song was pretty awesome. 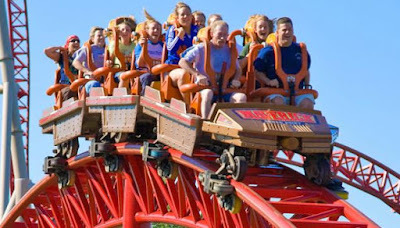 is the ride on the crazy train over? seriously tho - what a GREAT CARD! I need a Smith for my binder!